This color photograph of the overflowing dam in the center of Rehoboth Village captures the local consequences of the record rainfall Southeastern Massachusetts and Rhode Island experienced in the early spring of 2010. A series of large low-pressure systems that moved through the region from late-February to mid-March dropped between 17 and 25 inches of rain. Runoff into rivers and streams peaked in late March and early April, exactly when photographer Richard Benjamin documented the waters from the east branch of the Palmer River spilling furiously over the village dam. 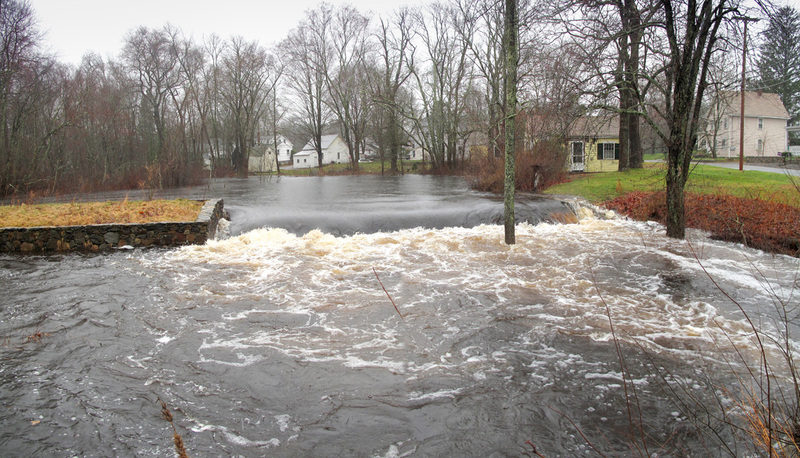 Benjamin, who lives in Rehoboth, also gave the Museum a photograph he took of the Perryville Dam in North Rehoboth on the same day, April 5, 2010, which shows water spreading out into the surrounding woods after it cascades over the crest of the dam. Regional flooding was so severe that Barack Obama declared a Presidential Disaster on March 29, 2010. Bristol County was among the jurisdictions that received more than $100 million in federal assistance. Benjamin, who worked as a photojournalist for the Providence Journal for 27 years and now takes fine art photographs of Rhode Island, has done work for the Carpenter Museum in the past, including documenting the 1993 raising of the E. Otis Dyer Barn exhibit space and creating a series on farming practices in Rehoboth. His photographs, whether recording the harvesting of crops or the height of a natural disaster, find the beauty in both the everyday and the extraordinary.